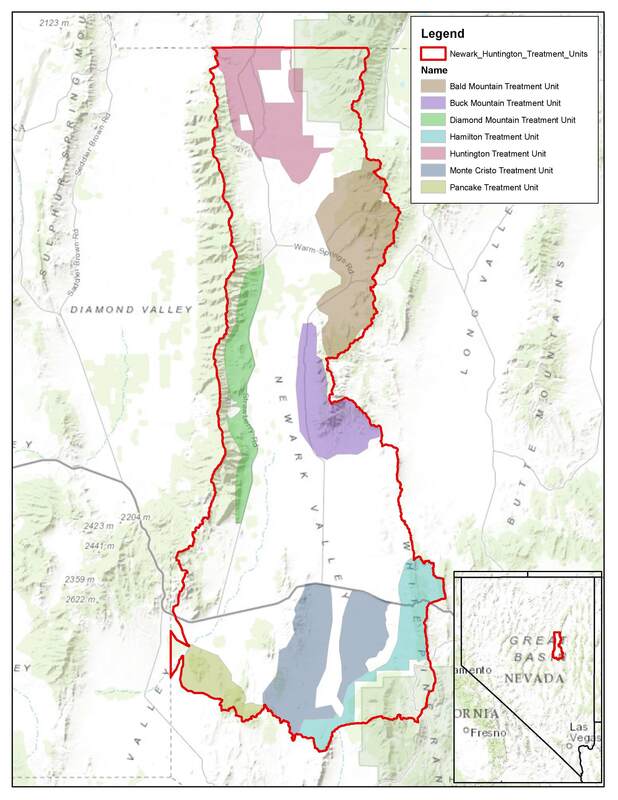 White Pine County, Nev. – A Western Watersheds Project appeal forced the Ely BLM to withdraw a recent decision to destroy Wyoming big sagebrush, black sage, and pinyon-juniper communities across the Newark watershed and parts of the Huntington Valley in Nevada. The BLM planned to use the cheatgrass-causing herbicide Tebuthiuron, mowers, bulldozers and other heavy equipment to chop and smash sagebrush and trees. These practices routinely result in an explosion of cheatgrass in arid landscapes. 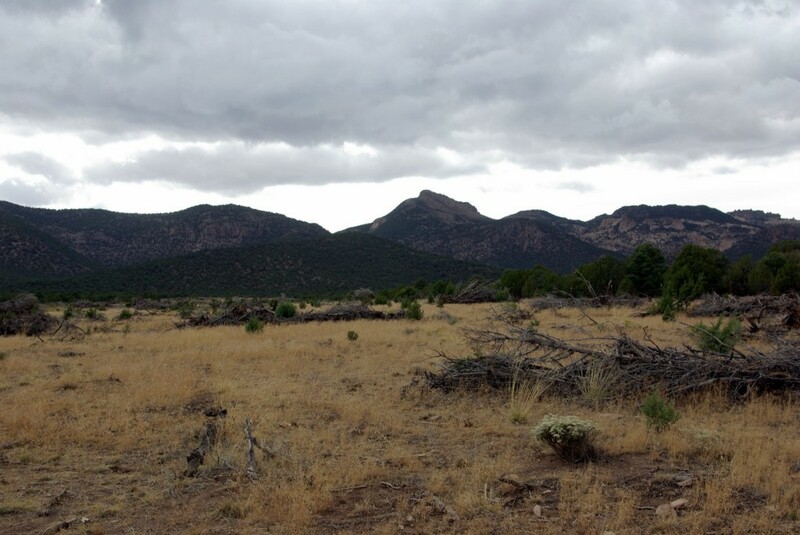 The Decision was withdrawn because the BLM planned so many treatment assaults on native vegetation in this area that the agency forgot to reveal them all in its shallow Environmental Assessment. The Newark Valley is located between the Diamond and Egan Ranges, south of the Ruby Mountains. Highway 50, the Loneliest Highway, cuts across its southern area. It is very arid, with beautiful Basin and Range scenery. A map of the allotment and treatment areas can be found here. The landscape is under siege. Grazing herds of both cattle and sheep on the same site inflicts severe degradation. Ely BLM land health assessment findings pretend there are no harmful livestock impacts. Blind to current livestock impacts, the agency blames the sage and trees, grazing in bygone days, drought, and mysterious “unknown factors” for declines in land health and sage-grouse habitats. Large allotments of the Newark landscape permitted to billion dollar foreign gold mines. Massive mine expansions are chewing away at sage-grouse and big game habitat, threatening scarce spring water flows, and imposing an expanding footprint of roads, noise, mine pits and other development. Past treatments using the same scorched earth methods as proposed in Newark have fragmented crucial sage-grouse nesting habitats for the southern Great Basin sage-grouse population. Under the guise of habitat “restoration”, BLM mowed, crushed, roller beat and doused Tebuthiuron on sagebrush right by many of the remaining sage grouse leks in Lincoln County. 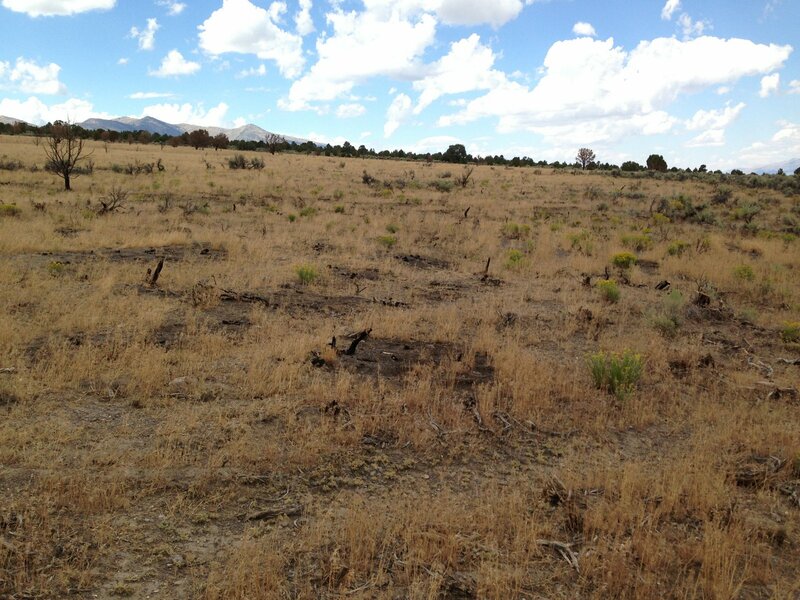 These photos are the result of hundreds of thousands of dollars of “treatments” – showing large areas of dead gray sage and proliferating cheatgrass. The Nevada BLM would do well to investigate all vegetation treatment and grazing decisions in the Ely District. The District’s management of 12 million acres of public lands is crucial to the survival of southern Great Basin sage-grouse. Western Watersheds Project’s appeal of the Decision can be found here. Wow! That’s great news. It must be Christmas around here, huh? Whoa! Now I know it really must be Chrismas! Thank you Western Watersheds, Ken Cole and everyone else that participated in the effort to protect public lands. It is absolutely irresponsible for the BLM to create nuclear winter on our public lands by poisoning, chaining and plowing large areas of natural vegetation. The pictures are mild compared to what it looks like just after treatment when the area is devastated with dead plants as far as you can see. Not only are all forms of plant life dead and dying but other life forms and the healthy soil organisms are also destroyed. Hard to believe we as taxpayers are paying for that travesty. Without question BLM and other government managers that approve removal of native vegetation critical to the survival of wildlife on our public lands using toxic chemicals and mechanical means should be jailed. You have to see and walk through the areas before and after to understand the long term damage caused by these activities. Sadly, its all being done using our tax dollars to please the livestock industry. Clearly, another subsidy to the cattle and sheep industry that must be discontinued. More wins like this are needed. It is hard to believe that native plant communities are being treated in this way on a pretense to help sage grouse. If sage-grouse are of greatest concern here, someone needs to convince me that juniper stands are good habitat for them. That’s not been my experience. There is good photographic evidence that juniper have expanded in many areas likely the result of fire suppression. Now that cheat grass is on the scene, it’s too late to return to a more natural let it burn approach and we have little choice but to continue with fire suppression to contain the spread of cheat grass. Juniper eradication or control must be approached far more carefully and probably on a smaller scale than was done in the past, but I am not convinced that blanket opposition to it is productive either. I respect and appreciate your extensive work in wildlife management. I just don’t believe that poisoning large areas of landscape with toxic chemicals is the best way to preserve and protect populations of native animals such as sage grouse, pygmy rabbits, and other small birds and mammals. At one time there were huge flocks of sage grouse on the Idaho National Laboratory reservation where they were protected. But over 50 years ago large areas of sage and juniper were intentionally removed and replaced with grasslands to graze sheep. The scars remain to this day. And now there are large burned areas as well where the sage and juniper have been removed. It seems like those areas would provide a long term data point for grouse management. How do current populations of sage grouse and other native animals in the treated areas of the INL compare with historic data? With all the biologic studies that have been ongoing for many years on the INL, are those data used to guide efforts in other areas? Rich – I hope I didn’t infer support for “….poisoning large areas of landscape with toxic chemicals….” because that is not my intent and I would not suggest anything that severe except in a very unique situation to maybe control a very aggressive invasive species. Above the cheat grass zone I think juniper can be safely reduced using controlled burning. Within the cheat grass zone juniper can be controlled with the old chain saw, and probably with other less labor intensive mechanical methods used carefully. During my time in the area I remember sage-grouse numbers the INEL (or whatever it’s called these days)holding relatively stable in spite of some large wild fires. I don’t recall any vegetation manipulation being done out there from 1987-2000. I can’t comment on what’s happened there in the most recent ten years or so to grouse or habitat. Juniper not withstanding, the federal government (BLM & Dept. of Ag) does not even recognize a major cause of sage grouse declines – cattle grazing. Cattle grazing within sage grouse country is considered to be a benign activity not even worthy of discussion or research. The Natural Resources Conservation Service (U.S. Dept. of Agriculture)states on its website: “The sage grouse population declines have resulted from habitat loss and fragmentation associated with land conversion, energy development, urbanization, wildfire, conifer encroachment, and invasive species.” ….. Not one even a little mention of cattle grazing in sage grouse territory as a cause of sage grouse declines. livestock beginning in the late 1800s. Uncontrolled livestock grazing reduced fine fuels and significantly reduced the frequency, extent and effect of naturally occurring fire. Ed – In your first post at least in my case you are preaching to the choir regarding livestock impacts to native ranges, unless USDA include conversions to crested wheat under the heading of “land conversion”. That said I also sense an all too common and puzzling hint at a two wrongs makes a right argument. If the agencies fail to list livestock grazing (wrong #1) then it follows that conservationists should fail to recognize that juniper encroachment degrades sage ecosystems (wrong #2) and therefore harms sage-grouse. Here’s another common one. Because there are far too many livestock on the range and the agencies won’t reduce them (I believe one is too many, but anyway this is wrong #1) then conservationists should oppose feral horse roundups (wrong #2) even though doing so is inconsistent and they cause more harm per head than do managed livestock. Thanks for your second post and the link. The claim that livestock grazing and resulting reduction of fuels and fires encourages juniper expansion is probably true. And from my long experience with sage-grouse I believe the cover photo, even with the remaining sage present, has already been lost to sage-grouse. From what I’ve seen they are not at all comfortable with any numbers of much of anything taller than about 3 feet around them. Of course grazers are now also claiming the same thing as a tool to reduce fuels, primarily cheat grass, and prevent sage destroying fires. Actually one proven method for restoring sage is to first seed the area to crested wheat, graze the snot out of it and sage will eventually return if there is a seed source. (Restoring forbs is an additional challenge.) This has been demonstrated repeatedly, although not by intent. I don’t have time to read the full paper you linked at the moment but I will later. Thanks. Ed, maybe they are mentioning grazing by cattle in that it is a solid truth cattle are not native species on our continent, and thus have to be considered invasives, regardless of who owns them. People trotting out the tired arguments about “feral” horses somehow manage to omit that cattle were brought by Spaniards, then later European breeds were imported. Horses at least have a nativity claim here, and might be useful as Mr. Chu describes, to “graze the snot” out of introduced crested wheatgrass to restore the sage steppes. Yes, I agree that domestic exotic cattle have no place on our public lands, and I also understand that horses evolved right here in North America and then spread to Asia and Europe. For tens of thousands of years horses evolved with our native Western plants, until the horse was wiped out by early man, only to be returned to North America by the Spanish in the 1500s and 1600s. “People trotting out the tired arguments about “feral” horses somehow manage to omit that cattle were brought by Spaniards, then later European breeds were imported.” I hope you weren’t accusing me of that because I clearly did mention “livestock” too in my comment. I favor the removal of all livestock from our public lands. I am unaware of any evidence that north American horses were wiped out by early man. It seems wherever there were horses and humans together the horses were domesticated for meat, milk and as beasts of burden, rather than being wiped out. At any rate if there were any horses left here they would look like the wild Pryzwalski (sp?) horse and other wild animals such as deer, pronghorn, etc – uniform color and conformation, not the mix & match bunch of horses currently out on our arid ranges. These horses are not wild horses, they are feral domestics. That said, yes domestic horses or cattle could be used for specific grazing goals if they could be managed and confined which I think would exclude feral horses. The key element in describing an animal as a native species is (1) where it originated; and (2) whether or not it co‐evolved with its habitat. Clearly, E. 6 caballus did both, here in North American. There might be arguments about “breeds,” but there are no scientific grounds for arguments about “species.” They are the same species that originated here, and whether or not they were domesticated is quite irrelevant…neither paleontological opinion nor modern molecular genetics support the contention that the modern horse in North America is non‐native. Actually horses have not co-evolved with this habitat for approximately 12K years. But following your logic if we were to release cheetah or lions here they too would be native since they disappeared from North America about the same time as horses. Actually if we want to reestablish a balanced ecosystem for the horse we also need to bring back their natural predators. And if we can engineer a mammoth they too would be fine on our landscape since they were once native. Your reference is from a highly biased source and I could provide just as many arguing the opposite, but I think we’ve strayed far afield enough for this string. My concern is for the health of the ecosystem and feral horses have a severe negative impact on our arid ranges. That to me is the bottom line. All livestock – managed cows, feral cows, feral horses,feral goats, feral sheep, feral pigs all need to go from public lands. I do not know if you are trying to obfuscate on purpose or you are playing games with words, but the species of American lion and American cheetah you refer to are EXTINCT, whereas the modern horse species (E. 6 caballus) evolved in North America and is still here thanks to the Spanish returning it to North America in the 1500s and 1600s – and they are a living, native, indigenous species. Ed -I disagree. The horses we are discussing here are no more native that the cheetah and lions that were here. Every single one of these horses is a descendent of domestic European horses and are therefor by every definition feral. They were brought here by humans. They would not have been able to swim back here on their own. If they were Przewalski’s horses I would at least give you an A for effort but of course they aren’t. These horses are not the native horse – not even close. All indications are the original horses died out here due to climate and accompanying vegetation changes, so it is incorrect to claim our ecosystems evolved with grazing from horses. Had the horses survived would they now occupy the harsh arid areas of the American west where they trash springs and riparian areas or would they like bison primarily have lived in lush valleys and in the deep soils and tall grasses or the midwest? I believe the arid west is too fragile for all but a tiny number of cows and horses. To protest the presence of cows or sheep on the range while opposing legally mandated control of feral horse populations is hypocritical and counterproductive if your interest is ecosystem health. I am not a horse hater – grew up around them and have”owned” a couple. I was excited as a kid to see feral horses on the West Desert of Utah. I see value in the Pryor Mtn horse refuge which tries to preserve a population of pure Spanish mustangs. And I recognize and accept that there will always be some feral horses throughout their current range. People don’t give a hoot about feral dogs or feral cows or feral pigs because they don’t have a love relationship with them, and it’s fairly recent actually that horses became a pet species. They were domesticated for meat, milk and transportation. The romantic image of the Marlborough Man and his cows out on the range which we often discount included the domestic horse he was mounted on. Occasionally those same horses escaped or were abandoned and become feral……and destructive. Here’s some interesting and I think objective reading on the subject. Seems to be a difference between keeping/managing wild horses (an icon come home) who mostly have managed to fend for themselves, in harsh environments (public lands, our public lands) that are too sadly laced with, and over burdened, with domestic livestock.. Asked this before, would the same forces behind keeping elk refuges alive and thriving (at huge expense) so there’s something to shoot, coming hunting season – be equally satisfied if they could hunt and shoot wild horses? Nancy – I am opposed to artificial feeding of wild elk. You didn’t answer my question, Theo Chu. Would the same forces behind keeping elk refuges alive and thriving (at huge expense) so there’s something to shoot, coming hunting season – ***be equally satisfied if they could hunt and shoot wild horses? I very seriously doubt it Nancy. I think most hunters prefer wild native species, I certainly do. Horse meat is apparently very good and it is eaten in many countries. I’m old enough to remember seeing it marketed here and I would eat it. And for what it’s worth horses actually rate equal or lower on intelligence scales than do cows. My experience growing up on a farm would confirm that. I hope I’ve answered your question.